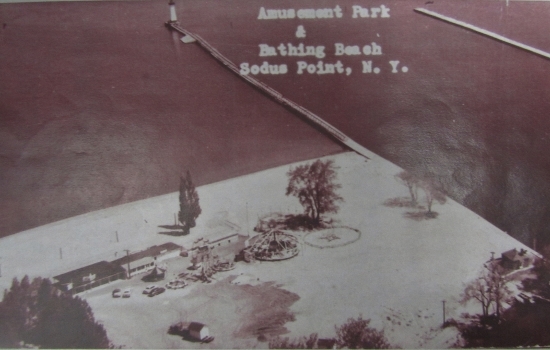 Sands Point Amusement Park, which was located at the site of the present day Beach Park in Sodus Point, began as a small resort with snack vendors and a sandy beach, and by the 1950s grew to a 6 acre park with a restaurant, grandstand, bingo hall, a hot dog stand and 7 rides. In the mid-50s it attracted upwards of 15,000 visitors a week in the summer. At various times, it had bumper cars, a merry go round, pinball machines, Skee Balls, pony rides and a train that went around it. The owner Mrs. Bilotta was a kindly lady who was known to give children 20 dimes for a dollar so they could play games longer. I remember running in bare feet across the hot sand to the park and the cool concrete as you went inside. The popcorn machine for a dime which I adored. The pinball machines, Skee Ball. The bands ended a couple years after we got there, but I remember the Battle of the Bands they used to have. And the great dunes in the off season up against the building, and digging in the sand for dimes and quarters. And sneaking under the wall in the Break-A-Plate with a baseball area, with all the shards in the sand. Good times. Mrs. Bilotta was my hero. I loved those bumper cars! Definitely one of my more favorite childhood memories. The place was small enough that if you went with a bunch of people you knew you could bump into one another with impunity and much laughter. There were locker room/changing rooms. I used to rent the keys, and make change for the arcade as well as roll the coins from the cash boxes. There were dances too, rock ‘n roll, twist…there were DJs and bands with radio station broadcasting them. We were bused to Sodus Point for summer swimming lessons (beginners in bay, swimmers, lifeguards in channel) and afterwards the kids headed to the Amusement Park candy counter for goodies. Seems there was an Arcade with restrooms inside too. Late 50’s there was the Eddie Meath DANCE PARTY. I also remember large sand dunes around the building mostly towards the channel. 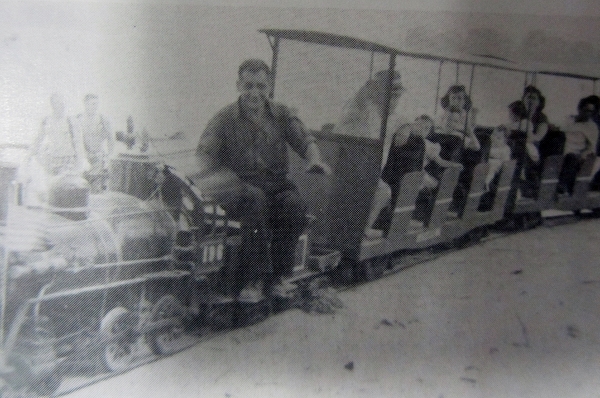 According to the September 6, 1968 edition of The Geneva Times, a New York State grant for $49,500 was made to Wayne County to acquire the amusement park and turn it into the present beach park. 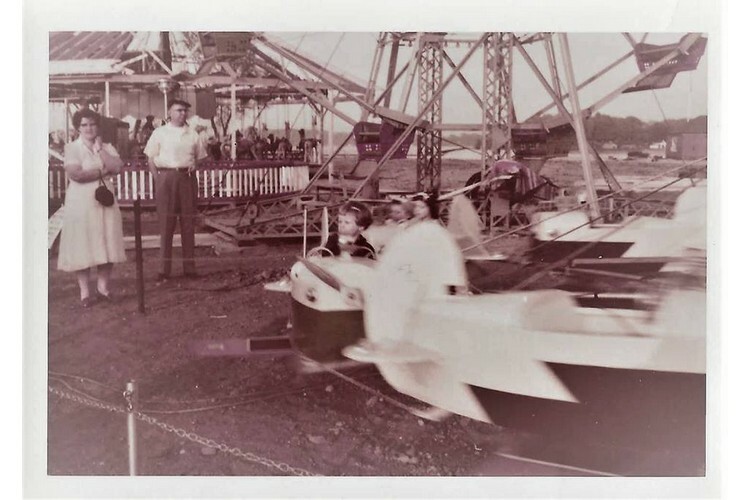 Sodus Point Amusement Park – My mother must have taken this picture of my sister Wendy and me riding (we had the bows) — my father is watching along with another woman. 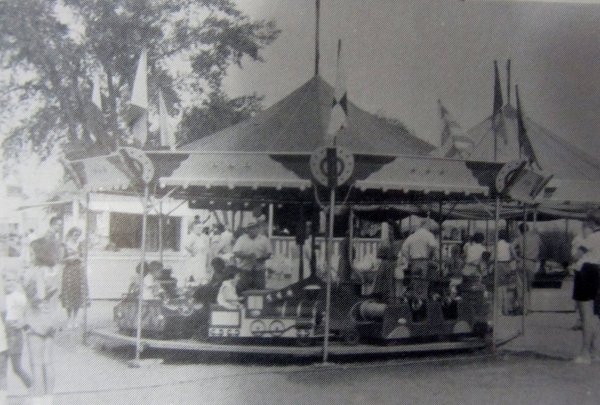 You can see the Ferris wheel and the merry-go-round — June 1956.